The February 15th selection from For Today is awesome, talking about the various kinds of honesty, with truth as an eternal unchangeable. I have had enough of cash-register honesty, tell-you-for-your-own-good honesty, and one-sided honesty. I want the self-honesty. And I know I can only reach that by working this program. such a dope I was – and you. calm, amazed to love you. Something struck me yesterday, and it seems appropriate to talk about it here. My comfort behavior in the car for many years was to stop and get something sweet when I was traumatized, frightened, angry, anxious, sad, bored...you get the picture. Every trip almost, however short the journey, at least once. Yesterday I left a tense situation at work to hurry to a meeting where I had a role and hurried to get back to more of the tense situation. I didn't stop anywhere, didn't eat the pile of candy sitting before me when I sat down at the meeting, shoved it in front of somebody else instead. I did engage in comfort behavior, but it was healthy behavior. And probably weird, but it was what I needed, and good for me. When my dad died on Christmas Eve, we played unusual music at the funeral with the efforts of my older son to make it happen. It was music very closely tied to both of them. After the funeral, son asked who to give the disk to, and I took it, put it in my purse, and when I got to the car, in the CD player. It's one instrumental piece, and it's less than three minutes long. It's still in the CD player in the car, and when I am fed up with the world, I push the CD button to play it, and turn up the volume to what we played at the funeral, "Loud enough!" And it comforts WAY more than an apple fritter would. I think I'll start being aware of the comfortable things in my life and keeping them in mind when I need the warm cuddlies. I had no idea exactly how long until I looked at the last post. But I'm here, still loving what's going on with life, still working program, and still struggling against it. I've had squeaky-clean abstinence since last Monday when I learned the last door has opened for the publication of the book of meditations I started drafting here on this blog. I expect it will be out within the next couple of months, and that's exciting. And scary. But this never has been my book. It started as meditations written so my mind would calm down enough to focus, and the progress of the book from here. In that post I said, "I can do this. I will do this. No, I won't. I will stand aside and let God do it through me." And that's certainly how it's happened. 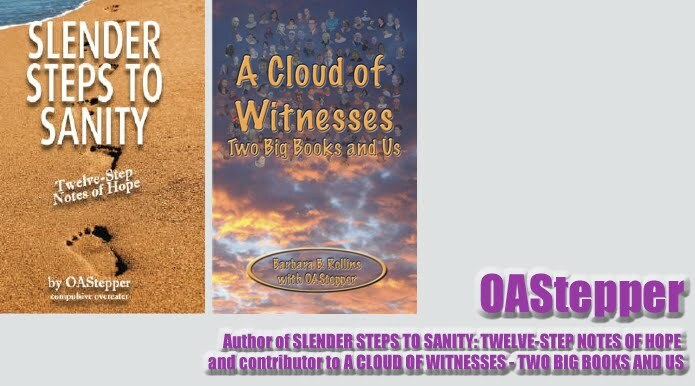 The book will be called Slender Steps to Sanity: Biblical Notes of Hope by a Compulsive Overeater by OAStepper, published by Eagle Wings Press . It's been almost a year since I finished the book, and I was eager then to get it out before the public. That didn't happen, and I see now that it's coming out on God's timetable, not mine. In the meantime, I've met some delightful people who have read the book and made decisions about it. Even more than that, I've grown a year in OA, and two years in OA may still be an infant, but I'm far beyond the point in recovery I was last March. How do I describe the difference? Tough question. I've struggled with food, having reached the lowest weight in the last thirty years and becoming complacent with that. Recently, though, what appeared thin to me I see with new eyes, eyes that see the 190 I weigh right now as fat. Not nearly like 300, but way too much for complacency. And I'd already awakened to that fact before getting the final approval, but this seals the deal and my abstinence has been more squeaky clean than my stated food plan even since then. Humility. I feel a lot like the Lancelot character in the movie Camelot. After describing an impossibly high standard for a knight of the round table, he answers his own question, "Where is somebody so great?" with "It's ME!" (Yes. I know the lyrics. I'm avoiding copyright implications. Here's the words.) Guinevere asks what he knows of humility. At the end of the movie, they've both learned the meaning of the word without question, and they live it. Maybe I've not grasped it that thoroughly, but I'm miles further down the road than when I wanted "my" book to come out. Now I'm ready to be the tool however God needs to use me. I've done a lot more writing, primarily poetry, that enhances the manuscript now. Okay, that's not a difference in me. I've a better idea how hands-off I need to be on marketing. I respect and understand better the traditions of OA. Anyway, I'm here, I'm back, and I'll post to this blog more often. Thanks for being there.